Over 30 years ago, Garth McLean moved from New Brunswick and got his first job working in a Federal meat plant as a truck driver. Eventually working his way to sales, Garth was dismayed with all of the chemicals and preservatives used, Garth then developed Canada’s first nitrate-free deli line called Natural Farms. In 2003, Garth’s friends Michelle Neilson & Deanna Bell joined Garth and together they rebranded the company as McLean Meats, drawing inspiration from the words “CLEAN” and “LEAN” in Garth’s last name. In 2006, Garth’s eldest son Justin McLean joined the company on the production floor. Working from the ground-up like his father, today he is in charge of supply management and logistics. McLean Meats follows the original principles and values that inspired Garth to launch his own company: clean recipe development, animal welfare and building a team that shares the same passion. 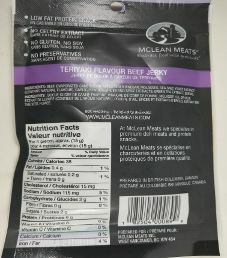 McLean Clean & Lean jerky is distributed by McLean Meats Inc. based out of West Vancouver, British Columbia, Canada. 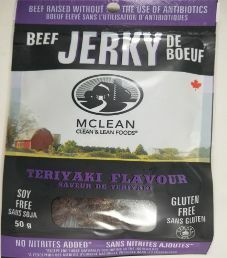 The next review on McLean Clean & Lean will focus on a 1.76 ounce/50 gram bag of their teriyaki flavored beef jerky. This will be the second review on this teriyaki flavored beef jerky, where the ingredient list and bag design has since been tweaked. The jerky was kindly submitted by the Director of Sales, Eastern Canada, Gina Lipton. Ingredients: Beef, Evaporated Cane Sugar, Apple Cider Vinegar, Molasses, Sea Salt, Yeast Extract (Contains Natural Flavour), Garlic Powder, Spices and Spice Extracts, Green Tea Extract, Smoke. The cattle have free range access to graze on grass. They are also ethically raised, meaning no additional antibiotics or growth hormones are given. The beef is carefully sourced from selected farms in the USA and Canada. As a result, the highest ingredient awarded can be Very Good (9/10). 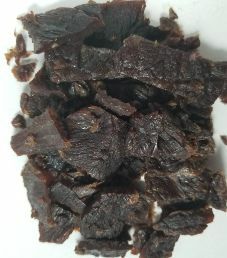 These strips of jerky are mainly small in size, and the thickness varies being thick and thin. The texture is more so on the soft and tender side, being fairly easy to chew. Handling these jerky strips does leave a slightly oily residue on your fingers. The aroma from this jerky is interesting and pleasant to say the least, where it’s challenging to pinpoint exactly what you are smelling. No singular flavor jumps out at first, but rather a remarkable, complex taste profile. 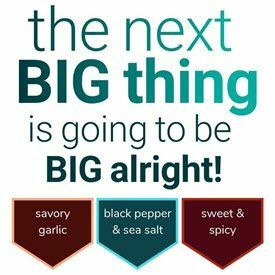 All at light levels are garlic, saltiness, sweetness, fruitiness, smokiness, and black pepper. There are other less noticeable foreign flavors that add to this intriguing taste profile. With only having a light level of sweetness, the natural flavor of beef comes across well. The surprising amounts of fat enhance the natural beef flavor even that much more when you are lucky enough to encounter it. As fantastic as this flavor tastes, there is little resemblance to a classic teriyaki flavor. 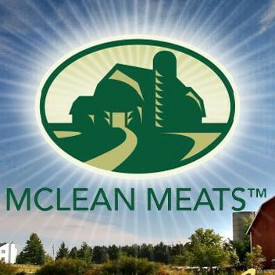 It is difficult to be critical here, as McLean Meats is merely sticking to their company philosophy of delivering a clean and lean product. A traditional tasting teriyaki flavor is typically sweet tasting, where this flavor is not so much, but that is good from a health standpoint. Normally soy is a staple of teriyaki, but McLean Meats proudly advertise this flavor to be soy free, where the majority of soy sauces out there are genetically modified (GMO). It’s as if this flavor was concocted to be the best possible tasting flavor, with little regard to it actually resembling a teriyaki flavor. Perhaps we can take solace that at least some sweetness was added in using one of the better sweeteners out there with evaporated cane sugar. This flavor delivers in giving a ‘clean’ and natural tasting flavor. This teriyaki flavor is downright addictive, where it was a massive challenge not to devour this 50 gram bag in one sitting. The various spices used worked their magic in my mouth. Only due to the technicality of not resembling a teriyaki flavor enough, we are awarding this flavor a Very Good (9/10) taste rating. This 1.7 ounce/50 gram bag was purchased for $5.99, which works out to $3.40 an ounce. That translates to an expensive price. Some slogans printed on this bag are “Clean & Lean Foods”, “Embrace Food With Gratitude”, and “Eat Healthy – Be Kind To Animals”. Some facts printed are “Beef Raised Without the Use of Antibiotics”, “No Nitrites Added”, “Soy Free”, “Gluten Free”, “No Celery Extract”, “Low Fat Protein Snack”, and “No Preservatives”.